Halloween has come & gone. It is so much more fun when you have kids to celebrate the holidays with. 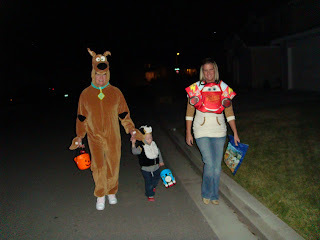 Dawson was supposed to be Thomas the Tank Engine & Landon was Scooby Doo along with Grammy! 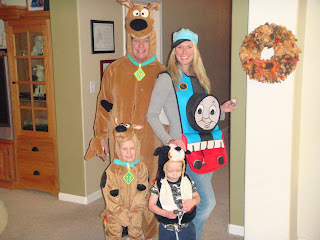 When it came time to put on our costumes Dawson wanted nothing to do with Thomas. Thankfully, we had a back up dog costume so I decided to go as Thomas. 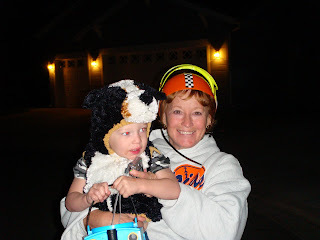 Grandma Becky wore a Speed Racer helmet & my sister Lisa wore Landon's Lightning McQueen cars costume from a couple of years ago. I can not believe that my mom got candy from every single house. She put her pumpkin bucket right up there with the boys' buckets & every time there was a deposit of candy placed into the bucket. She got more attention in her costume than any other kid out that night. It was a hit with the kids & adults. David handed out candy with his friend Tim & Uncle Joe. At the end of the night he was cussed out by an eight year old. There is always one kid that spoils all of the fun! 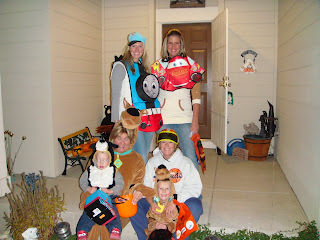 I really can't say who had more fun this Halloween, the adults or the kids!! !